Its been close to 2 weeks since I have been here and I thought its a good time to write about some of the stuff that I have observed over here. Before every station, there were clear announcements as to which is the next station and the duration for which the train would halt at that station. This was very helpful since we had lots of baggage with us and it calmed us down a lot when we knew that Malmo is the last station and the train would stay there for close to 15 minutes. The sunrise and sunset were some of the initial shocks. It was 5 pm when we reached Malmo and it was pitch dark. The sun doesnt rise till around 0830. So it was like going to office in the dark and coming back also in the dark. The pedestrians have their way most of the time here. The vehicles would stop if they see anyone crossing or even when they feel that someone is approaching the zebra. So now I am used to walk right past the road. If I do the same in India ... I would be killed ... in a very bad way :P. People who are driving bring along lots of stuff with them for TP in case they have to stop if people are crossing. For example ... sandwiches, newspapers, etc. There are also buttons at each crossing for pedestrians that speeds up the Green signal. Divine. There is a digital status board at each bus stop with route information and the due time for each bus. Additionally, there is an asterisk for each bus on this board which denotes that the bus is close by. And the bus will stop at the designated place and not an inch further or behind. There are buttons available to every passenger which can be used to inform the driver that you want to get down at the next stop. If there is no1 who presses this button and the driver finds that there is no1 who is waiting to board the bus either, then he will not stop. 30 eggs are for 25 Kronors, Onions are 5 Kronors for a kg, Potatoes are 8 Kronors for a kg, Tomatoes are 4 Kronors for a kg, a Bread packet containing around 30 slices is for 10 Kronors, boneless Chicken is 75 Kronors for a kg, a lite of Milk costs 10 Kronors, a litre of cooking oil is for 17 Kronors, etc. On the first day of office, I was given the Tieto Sweden card to access stuff in the office here. The HR came up and gave me yet another card. It was the medical insurance card. Yesterday, I was the proud (??) owner of yet another card. The monthly bus card to roam around Malmo any number of times during one month. Lagta hai patte khelne baithna padega ab ... or do I need a card for that too? 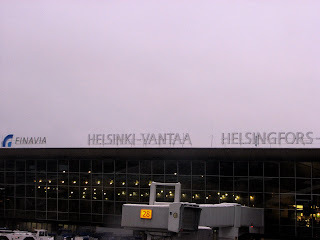 Sprint across Vantaa ... !! My seat number was 59J ... the total capacity was 60 seats and I was sitting in the tail of the aircraft. The aircraft had just one exit and it was going to me an arduous task getting to the exit. We touched down at 1435 and it was 1445 till I came out of the aircraft. Now what? I had to find my way to the "Connecting flights" section. Fortunately, I found the section sooner than later. The gate number for my flight was 28. I had to go through the security check in. I had 2 bags with me. One laptop bag and the other a carry-on bag. The carry-on bag contained ready to eat stuff like Maggi, etc. It also contained something that was going to set me on a marathon across Vantaa. It was a bottle of aftershave lotion. The limit on such liquids is 100 ml and unfortunately mine was 150 ml. Dratch. One ... remove the aftershave lotion OR Two ... check in my carry-on baggage. For some reason, I didn't like the first option. I agreed to the second option. I was asked to proceed to a counter with my baggage. It was 1455 and I had to wear my belt again along with putting everything back in my pockets. I met a person at the counter and he asked me to furnish my passport. He proceeded to ask me something which I did not understand in 2 attempts, primarily due to his accent but it was more to do with where I am headed to. I replied with Sweden. He pointed me to his left. I asked him, "Where am I supposed to go? I am in a hurry". He said, "Find it". I did not have time to be surprised by this. I headed to the direction he mentioned and saw lots of counters. I went up to a counter and met the lady at the counter. She was courteous enough to inform me that counter number 215 is the one I should be going to. I asked her for directions and she told me its towards the right. All this while, I descended from the 1st floor to the ground floor of the airport. I went up to 215 and let the lady know my state. To my surprise, she took it up urgently and said just one thing ... "Sir, I will make sure your bag is boarded in the aircraft but I must tell you that you need to run". No wonder ... it was 1520 and I was wondering if I would be allowed in. Surprise, surprise. Another security examination since I was using a different entrance of the airport. Double Dratch. I went through everything again. The belt, watch, wallet, etc. It got over in 5 minutes. I had to climb the floor I already descended but from a different direction and make my way to gate 28. When I reached the first floor, I was at gate 13. I had to run across 15 gates to reach gate 28 at 1530. The people were still moving to board the flight. That sight made me feel great. I boarded the aircraft and thanked my stars for everything.